One or two questions are expected from diodes in GATE.The article provides tips to solve questions on application of Diodes.Learn how to solve these questions. A diode is forward when anode is more +ve than cathode, otherwise it is reverse biased. Check whether the diode is forward biased or not. Reduce the circuit using thevenin’s rule where possible.The basic procedure fo Thevenin’s Theorem is remove the load resistor RL or component concerned . Find Resultant resistance by shorting all voltage sources or by open circuiting all the current sources. Find equalent source voltage by usual circuit analysis methods. Find the current flowing through the load Resistor. 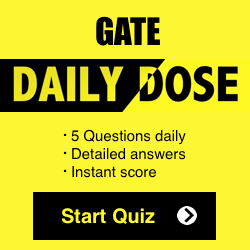 FREE Daily Quiz on Electronics for GATE-2017 Preparation. Replace all diodes with short ckt. Take a current I from anode to cathode at any test diode. Find I .If current is +ve , then the diode is forward biased. ( 0-(-10))/10 + (0-10)/5 =-1A, hence D1 is reverse biased. Step 1 : To solve clamper circuit , find the capacitor voltage Vc in its steady state. Step 2 : Replace the diode with open circuit and draw the output form. Capacitor always charges to its maximum open circuited voltage in its steady state. Vo minimum will be there when Vi is minimum, means we are applying -5V so it is reverse biased. As it is reverse biased ,no current is flowing through resister,so no voltage drop at resister,Hence Vo miniumum is -5V. We assume D2 is on and D1 is off, as D2 need less cut-in voltage to get forward biased.If D1 is at off all voltage is given to D2 so it is in On State. It is less than cut-in voltage ,so it is in off state.